One day, at my son’s nursery school, I saw that his mail pouch contained his teacher’s mid-year assessment. I read it eagerly. “Expresses ideas clearly.” Check. “Plays well with others.” Check. “Fine motor skills: advanced.” Check. And so on. I folded up the paper to slip it into my bag and noticed the sheet was labelled “David.” My son’s name is Gray. I had grabbed the wrong handout. No big deal, except that when I read Gray’s assessment it was 99% identical. Gray is my second child and at my older son’s nursery school, I had come to deeply value the insights his experienced teacher could give me about Dane. When he was four his teacher figured out he needed glasses and also a great deal else about what made Dane, well, Dane. What did I know–I was doing this for the first time! So I was very disappointed to see this cookie cutter assessment of Gray. I knew this kid would only be my “clay” for a couple more years–I welcomed all perspectives the school could add, and the otherwise skilled teacher let me down. I told the school director what had happened and, to her credit, she did a major overhaul of the assessment system. By the time my third son went to the school, the reports had become very insightful and helpful. The benefit of these conversations and reports to me as a parent was immeasurable and they are a parallel to the role of a good performance review in a business environment. Every employee deserves a custom, thorough assessment of their year and a set of goals and areas for development for the next. It sounds basic but it is really hard to do well. We are finishing up our second cycle of annual assessments at The Grommet and are still learning. This year I am finding our managers are falling short on including specific development guidance, so we are adding some more of this to the reviews before we deliver them individually next week. I don’t mean annual goals–I mean the deeper stuff around skills, behaviors, and knowledge gaps. It’s hard to deliver such “areas for improvement” because they can seem like simple criticism or too personal. I see them as the opposite–you would not bother to advance an employee’s abilities if you did not see high potential in them. Here are three performance management tips I have learned through The Grommet. The CEO must set course. At the beginning of the year I write a “CEO letter.” It’s a couple pages of reflection on the prior year’s learnings and the goals for the new year. (Thanks to Tony Tjan for this idea.) I share the draft with my direct reports to make sure they can see enough relevant guidance in it to create objectives for their team. Then I release it to the whole team and board. What did not go well. My co-founder Joanne Domeniconi likes these meetings because they set a non-emotional pattern for having harder conversations and also give her and her direct reports a chance to “put the week behind them.” We also find that having this Google Doc handy at the end of the year is invaluable for when the employee sits down to fill our their self-assessment portion of their review. Massive Q1 accomplishments can be too easily overshadowed by recent months and this keeps the full year in perspective. 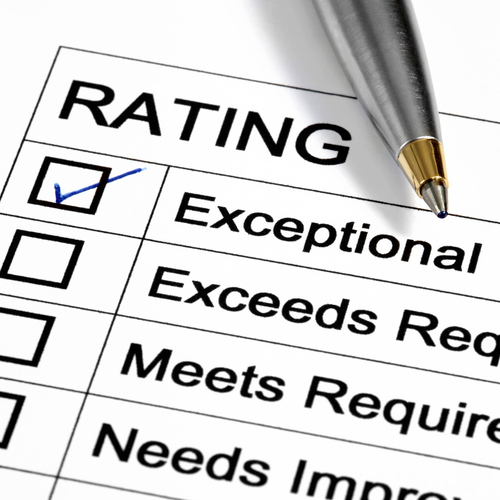 Performance Reviews include Development guidance. One of the best ways to frame that thinking, as a manager, is to ask yourself, “if I were promoted and my direct report took my job what gaps would they have?” Alternately, it is helpful to ask the employee what their career goals are, long term. They may not want your job at all, or simply be too junior to expect that outcome, but you can help them reach other goals. This question of “gaps” is key because it can also help a manager realize why they should not hoard expertise, relationships, or visibility. That is the fastest way to make sure that you yourself are not promotable, if no one else can take over your job. The art of management is one I am still learning myself so I take comfort in creating fair and uniform assessments and tools so that we can all learn together. Does entrepreneurship make women unhappy? I agree that reviews for children should be much more involved to be helpful, but as an adult, I must share my favorite review, “Basically, your crown is on order”. I floated away from that one!! Woah. How great! I think I would have retired the next day. I could only go down from such a superlative. To grab a phrase often used by Des, ‘brilliant’!